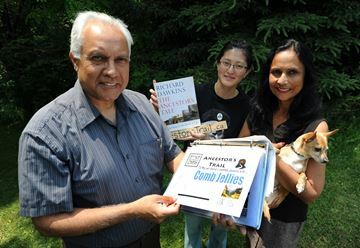 Mississauga veterinarian Kevin Saldanha will lead an Ancestor’s Trail hike, tracing one billion years of evolution, along the Culham Trail on Sunday. The walk is based on The Ancestor’s Tale by famed British evolutionist Richard Dawkins. From left, Saldanha,volunteer Teresa Tang, and his wife, Lisette, with pooch Pingu. MISSISSAUGA — Ten years ago, famed evolutionist Richard Dawkins published The Ancestor’s Tale, a book loosely modelled on Chaucer’s Canterbury Tales. Instead of pilgrims journeying to Canterbury, Dawkins’ protagonists are living species — humans included — travelling back through evolutionary time to their point of origin. The book, which was nominated for the 2005 Aventis Prize for Science Books, inspired a series of Ancestor’s Trail hikes in the author’s native England. But you don’t have to flit across the pond to participate in one. Here in Mississauga, it’s replicated by Kevin Saldanha, who, when he read The Ancestor’s Tale, got the idea to recreate that march through time along the Culham Trail. This year’s hike — the fourth such — takes place Sunday from 8 a.m. to 12:30 p.m. Although the hike, as described in the book, was originally conceived as a walk back in time, Saldanha decided (for logistical reasons) to plot the hike starting with the dawn of multicellular life approximately one billion years ago and ending with modern man. The 12.5-kilometre trek starts from Erindale Park and, roughly following the banks of the Credit River, ends with a barbecue lunch at Pinecliff Dr. Park in Streetsville. For a less taxing outing, participants can also join the hike at various points along the route. Go to http://www.ancestorstrail.ca/ for rendezvous times and pledge instructions. Saldanha has set up the trail so each stride of 0.75 metres represents 60,000 years. A scant 6.25 centimetres represents 5,000 years of human civilization. At a gingerly pace of approximately three to four kilometres per hour the hike will take about three to four hours. There will be rest and refreshments stops and checkpoints where participants can get their passports stamped while discussing specific issues on evolution and species in distress. Saldanha says the notion of a common ancestry, that humans came from other beings and not just apes, isn’t something taught in most schools. The biggest challenge during the hikes, says Saldanha — who, when he’s not pondering evolution, works as a veterinarian — is helping participants comprehend the scale of time.